A whole lot more people know a whole lot more about the little things you like, or dislike. Because many are doing it, brands’ revenues are affected. You’d say “I’m never coming here again” and Coffee House XYZ would lose one customer. Coffee House XYZ can potentially lose tens or even hundreds, maybe even thousands of customers if that experience is broadcasted via social networking websites. Oops! But how do you make people talk about you? A simple screen in a store might not be the ultimate answer. The article seems to hint there is a direct relation between personalisation and positive WOM. People enjoy being greeted (by name) when entering a venue and advised on what products to buy based on their past history. This in-store ritual might not be possible anymore for most venues for several reasons: high inflow of customers, bussier customers, low- customer loyalty, not enough staff. So how can an offer be personalised with limited resources available? Several options exist with their own shortcomings. Instantly personalized printed ads– available in NYC only for the moment, of receipt size and handed after the transaction is completed (read more here). Foursquare addresses the greeting issue by encouraging customers to check-in and be rewarded while also offering the less-tangible benefit of a personalised hello. But there are other gaps that still remain unfilled. Locamoda for example, tries to address the customer engagement issue with their social media application for digital signage networks and transform the screen into a 2 way communication platform (otherwise we’ll all get bored as even the most interesting content gets obsolete after a while plus it’s costly). 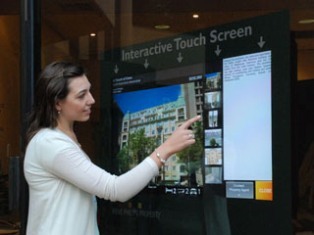 Another solution are the big format touch screens that allow users interact with the content and have a more playful brand experience. Yet this alternative is unfeasible for many brand owners without the necessary budget at hand. An even more engaging technique is involving the customer in the content creation process rather than simply serving him/her an information deemed relevant from a seller’s perspective. 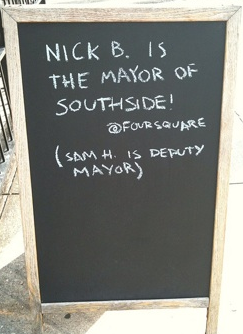 A TechCrunch article mentions a restaurant allowing its top Foursquare customers design the menu once a month; menu that could be then displayed on a digital panel (as it seems it’s ”chalkboarded” at the moment). 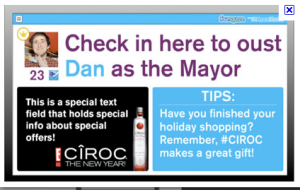 The article suggests making the whole thing more fun by involving other Foursquare users whose ideas and comments are to be posted in real time on a screen. …and be sure you’ll be named in tweets and updates (long live free advertising). The challenge is to find available & affordable tools to engage the customer in the conversation rather than over-relying on internal/outsourced advertising for delivering a message you think it’s important and that might be soon forgotten. Take personalisation at a higher level.